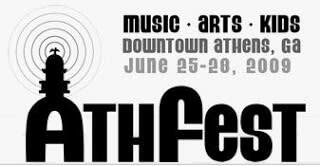 AthFest, the annual arts and music festival held each June in downtown Athens, is almost here and this year&apos;s headlining bands have just been announced. AthFest has showcased the best in local, regional and nationally recognized music for the past 12 years and this year will be no different. More than 175 bands and artists will perform throughout the festival which will be held June 25-28 2009. All performances will take place on two outdoor stages and are free of charge to the public. The festival features music, arts, food and an evening "club crawl." On Friday, June 26 at 9 p.m. the main stage will feature The Black Lips, a self described "flower punk" band from Atlanta known for their frenzied live shows. Dead Confederate, who recently preformed on Late Night with Conan O&apos;Brien, will co-headline at 7:50 p.m.
On Saturday, the main stage will feature Patterson Hood &amp; the Screwtopians. The line-up includes Drive By-Trucker&apos;s Patterson Hood, John Neff and Brad Morgan; Centro-Matic&apos;s Will Johnson and Scott Danbom; and David Barbe. Closing the festival on Sunday at 7 p.m. will be the Randall Bramblett Band, a legendary Athens musician who has performed and/or recorded with Steve Winwood, The Allman Bros. Band and Widespread Panic, just to name a few. Add to that the "club crawl." What would Athens be without its nightlife of course? The "club crawl" will take place Friday and Saturday night and guests may purchase wristbands in advance for $15 or $20 at the festival to gain entrance into almost 20 music venues across town. Mark your calendars and visit here for more information!